In many parts of the country, winter means the potential for snow and ice. This creates poor road conditions, making it difficult to travel. It is important to plan ahead for the potential challenges that the season may bring. This can be done by preparing your vehicle for the weather and by following winter driving recommendations. Here are a few tips that you should follow to ensure that you remain safe on the roads. 2. Perform A Maintenance Check. Inspect your vehicle before going on a trip, even a short one. Check to ensure that all parts and components are working as they should be. Be sure to check tires, windshield wipers, fluids, and lights. Replace your wiper blades if the rubber is cracked. Headlights are crucial for visibility during winter storms. Invest in a headlight restoration kit if your headlights have become cloudy or begun to yellow. Proper tire pressure and tread is important, because snow and ice make it harder for your tires to maintain grip. Check out our Car Maintenance Guide to learn more. Speeding is one of the major causes of accidents. When the weather is bad, it is even more important to go at or below the recommended speed limit. A slower speed will allow you more time to react if a situation were to occur. Give yourself plenty of time to stop safely. Allow more time for braking by maintaining a safe distance between yourself and the car in front of you. The general rule, under normal driving conditions, is three-seconds, meaning you should be at least three seconds behind the car in front of you. In winter weather, you may need to leave more room. 5. Watch For Black Ice. Black ice is a dangerous winter weather condition. It is one that is not easy to see on the roads. It comes in the form of thin sheets of ice on the roadways when the temperatures drop close to freezing. The roads may look as if they are wet. This is why you should begin to stop well before approaching an intersection. 6. Be Cautious When Mountain Driving. Mountains are difficult to travel under normal driving conditions, let alone in winter weather. This is because of the steepness and curviness of the roads. Tire chains may be necessary when doing this type of driving. Anytime you are driving, you should obey the rules of the road. Traffic laws are intended for your safety, as well as the safety of other drivers on the roadways. This is why it is important to follow all road signs, go the speed limit, and avoid distractions. Learn more Auto Safety Tips. 8. If Stranded, Stay Safe. If a winter storm leaves you stranded or makes it unsafe to drive, use your best judgement. Pull off to a safe location, and turn on your hazard lights. Call for help, and wait in your vehicle until someone can arrive. Use your lights, heat, and radio sparingly to save your car’s battery. For warmth, you can use blankets in your car, or run your car for 10 minutes every hour. 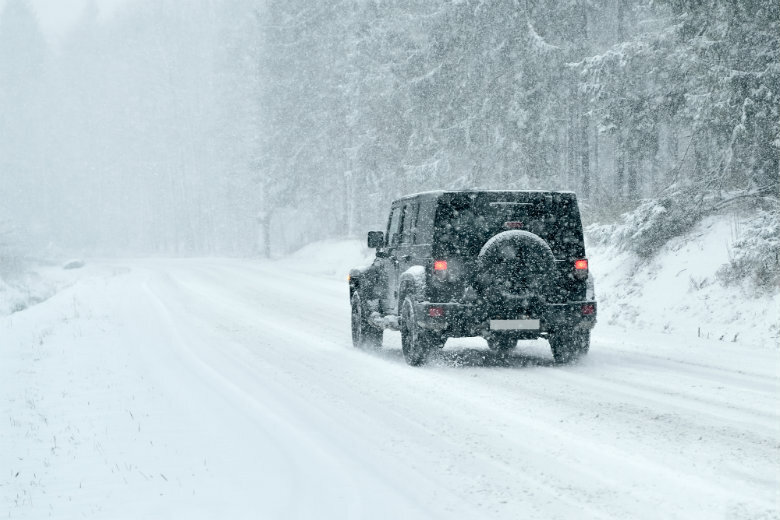 These tips are intended to keep you safe when traveling in poor winter weather conditions. As you can see, winter driving presents many risks. If you are planning on traveling long distance, the safest way to get your vehicle to its destination is with an auto shipping company. By hiring an auto transport company, you do not have to worry about driving on the roads. National Dispatch is a top provider of nationwide auto transport services. We ship all types of vehicles, including luxury, classic, exotic, and sport models, to individuals and businesses. Request a free, instant quote to find out how much it will cost you to ship your car. No personal information is required. You can also call us at 800-321-2051.